The first four books in the Betsy-Tacy series are my favorite. I like them as little girls with big imaginations, instead of bigger girls with big crushes. I can identify with so much of the little girl antics (wait...) and find them very appealing. When I first read Betsy-Tacy (two years ago, during Sarah's first challenge) I fell in love them them. I also did not have a daughter, nor did I know a daughter was to be in my future. Now that Baby Girl is a part of our family, I found myself liking Betsy, Tacy and Tib even more than before. I can envision many happy reading hours spent with my daughter and these characters created by Maud Hart Lovelace. I look forward to that. But for now I'm amused and entertained by them all by myself. They produce a rather nostalgic feeling in the reader. It makes you miss days where you knew it was safe to run around the neighborhood with your friends. These books make you miss quiet streets next to nature instead of having your back windows looking into your neighbor's back windows. These books make me want to create outdoor SPACE to explore and dream in for our own kids. 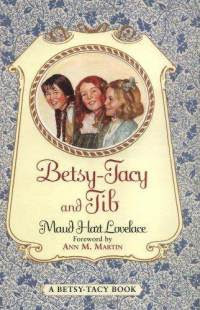 Re-reading Betsy-Tacy and Tib reminded me the most of one home that we lived in when I was growing up. This home was two blocks from the bay, down in South Texas. My friends and I would get together and walk down to the bay when the tide was out and would wander along the sand and would walk out as far as we could before reaching the water. We'd collect things and write things in the sand. We'd crawl around the rocks by the water and all without an adult in sight. Why? Because it was safe and we could. It was peaceful, quiet and it filled our senses with good things. We'd play outside until the sun went down and only go inside when we had to. I loved that house and our time there. I was eight then, just like Betsy, Tacy and Tib are in this book. "Tacy knew what Betsy was thinking. "I wonder what it will be like to be grown-up," she said. "I don't think it will be as nice as being children," said Tib. :Neither do I," said Tacy. "You don't want to be grown-up, do you, Betsy? At least, not right away." Betsy sat for a long moment and thought. She thought about the fun it was being a child. She thought about the Hill Street Hill, and their bench. She thought about the Big Hill and the ravine and the Secret Lane. She looked up into the green shade of the oak tree and thought about the backyard maple. Isn't that always the way? We can't wait to grow up or be just a little older all the time? And then we wish we were younger again. Better to live each day to the fullest, learning to be content in whatever the season and situation of life. Before you know it, your current season will change (again) and you'll miss something old and anticipate something new. Reading this passage re-reminded me that my time in any season and at any age is very limited so I'd best not spend my time wishing for things that can't be just yet. I can certainly dream and make good decisions which will affect the future. But I can only live today. I remember having conversations such as the one above with my friends. We waiting for 10 (that was a big deal) and then 16 and then 18 and then 21. And nothing was what I expected and I found that the age didn't really matter at all. Not a wit! Life isn't about numbers. They just help mark time. Rather, I care more about what I'm doing with my time. Time spent wisely and well is far more important to me than how old I am in any given moment. I sure still do love this series of books and I'm glad I got back 'round to reading at least one of them during the month of October. Thanks, Sarah, for hosting and motivating me to revisit these charming classics. I do remember those days of roaming around the neighborhood by ourselves and regret that my kids couldn't do the same. Ahhh, such delightful books. I agree with you, however, I prefer the first few and don't like them so much as they get older and more boy crazy. I was given the first four books as a birthday present when I was around B,T&T's age too. Oh my word! How I loved them. I should read them again just cause. What a neat thing--to grow up that close to the bay! As someone who really only loves the beach at low tide, this sounds delightful!